An Owl ডিজনি family. 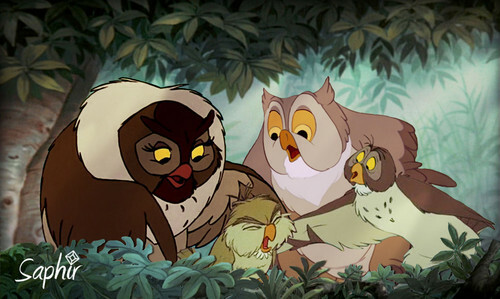 Archimedes from the sword in the stone, Big mama from The শিয়াল and the hound, the owl in Bambi and the owl from Winnie the pooh. HD Wallpaper and background images in the ডিজনি ক্রসওভার club tagged: disney crossover sword in the stone bambi winnie the pooh the fox and the hound saphir. This ডিজনি ক্রসওভার photo might contain নকল মানুষের, কমিক বই, কমিকস, and কার্টুন. "Do আপনি Believe In Fairytales?"